The teacher of appearances as symbol arises around me. Indescribable this dance of magical forms! appearance and emptiness, I pray to you. Give me the energy to know directly the activity of being as appearance. The teacher of sound as enchantment arises intermediately. Inconceivable this concert of harmonies and songs! In experiencing the natural freedom of sound and emptiness, I pray to you. Give me the energy to know directly unceasing being as quality. The ultimate teacher of awareness itself arises within. Limitless this panorama of thought and memory! In experiencing the bliss of clarity and emptiness, I pray to you. Give me the energy to know directly unborn being as what is true. Are signs that point me to know directly the nature of being. They are solely expressions of my magnificent teacher. In recollecting your great kindness, I pray to you. Give me the energy to know directly the nature of all experience. Whole oceans of the three roots are everywhere present. They dance like moons in the water of the student’s devotion. They never are anything but the venerable teacher. In experiencing realization of all capabilities, I pray to you. Give me the energy to fuse my mind with yours. Give me the energy to release fixation on a sense of self. Give me the energy not to have needs. Give me the energy to develop love and compassion fully. Give me the energy to give rise to uncontrived devotion. Give me the energy to end materialistic thinking. Give me the energy to release confusion into its own ground. Give me the energy to know directly mahamudra, the nature of being. Give me the energy to attain full awakening in this single life. May I wear the jewelry of pure discipline and ethics. 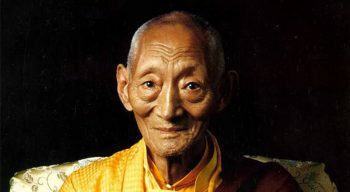 This heartfelt song about experiencing the world of experience as one’s teacher was sung spontaneously by Karma Rangjung Kunchab (Kalu Rinpoche) at the request of the diligent practitioner Karma Sherab. May it cause the energy of the glorious teachers to enter his heart. This song of devotion was translated by Ken McLeod at the request of Daniel Boschero so that he could use it to cultivate faith and devotion.